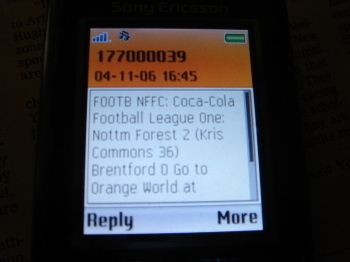 This is pretty much the extent of my relationship with Nottingham Forest now. They're never on the radio outside the Midlands and very rarely on the TV, and I'm never motivated enough to sit by the internet on a Saturday afternoon. So most weekends I'm buzzed by a series of texts telling me how they're getting on. It's kind of compelling, but it's more like mobile ceefax than anything else. And it illustrates why sport is such important content - it's because sport is live, and unpredictable. Sport is spectacle. And even this crappy text-based connection to it is actually important to me. And basic info also allows the mind to fill in gaps. As a passionate F1 fan living in Australia I don't get to see TV coverage of qualifying yet thoroughly enjoy watching live timing on the net. To a casual observer it's meaningless and idiot. To me it is an opportunity to create a mental commentary and exercise imagination allied to logic driven by very finite data. "idiotic" - apologies, I'm a stickler for my own typos. Wonder if old Clough gets those text messages? If he does he'd have to be turning in his grave?